The Museum’s vibrant connection with surrounding communities is manifest in almost 70,000 hours of time generously donated each year by hundreds of volunteers of all ages and backgrounds. Integral to daily operations in almost every Museum function—both frontline and backstage—and helping out with conferences and other types of special events, the Museum is deeply indebted to its volunteer ambassadors. The Museum’s internship program provides a professional work setting for selected college students to bridge the gap between their classroom experiences and their intended careers. Internships provide a forum to learning new skills or using and refining career goals of university students. 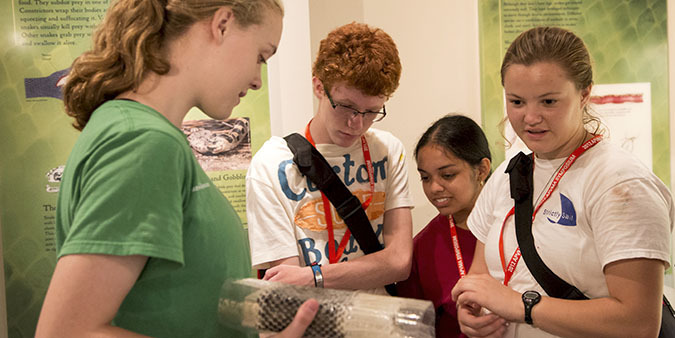 Students can earn academic credit by working directly with Museum staff in many areas. Learn how you can volunteer by visiting the Volunteers page. Apply for an internship today by heading over to the Internship page.